Welcome to my unboxing and first impressions of the Yamaha MusicCast 20 wireless speaker with Amazon Alexa voice control built in. The Yamaha MusicCast 20 retails for around £199. Built in streaming services include Spotify, Deezer, Tidal, Pandora, Napster, SiriusXM and qobuz. Apart from the multi-room options, Yamaha provide an app that allows full control of the speaker, its nultiroom options and more. Apart from built in WiFi, it has bluetooth and Apple AirPlay. With all this functionlity, this really makes this speaker a great offering. It also puts out a respectable 40W of music. At £199, the Yamaha MusicCast 20 represents great value for money. It is extremely versatile too offering tons of different ways to connect to it, Amazon Alexa voice control, bluetooth and AirPlay. It is also available in black and white finishes. Buy from Amazon UK – Click HERE. Apple iPhone 6S – That naked feeling – To case or not? From day one I got a case for my iPhone 6S Plus. I also bought a screen protector and a tempered glass screen protector. After applying both screen protectors one after another I decided I hated the way both screen protectors ruined the view from the front, so removed them. Touch wood, I have no scratches on my front screen. Now to the subject of using a case. As I said I fitted a case from day one. I bought the Apple silicone and leather case to start off with. The silicone case in my opinion made the phone look cheap and I didn’t like the feel and dust collecting abilities of the silicone case. There are some benefits of using a silicone case in that if you have an Apple Watch you can buy matching sports straps. So I settled with the Apple leather case with provides extra grip and slightly more protection should you drop the phone. Move forward to a few days and I received some clip on macro and fish eye lenses for the iPhone. To use these you have to remove your case. And then I stepped back, looked at the iPhone and thought “wow”. The iPhone 6S Plus looks damn gorgeous without a case. And now I’m left with a dilemma. I don’t want to put the Apple leather case back on BUT the consequences of not having a case and being unfortunate and dropping the iPhone could be a costly affair. The chances of dropping it are higher without a case as the aluminium finish is slippery. So I have this emotional feeling to decide to whether to use my iPhone naked or cased? What do you do with your phone? Every day several articles or review go live. The back catalogue of reviews and information is extensive. If you want to find if there is information on a particular topic use the search option (magnifying glass icon) near the top right. 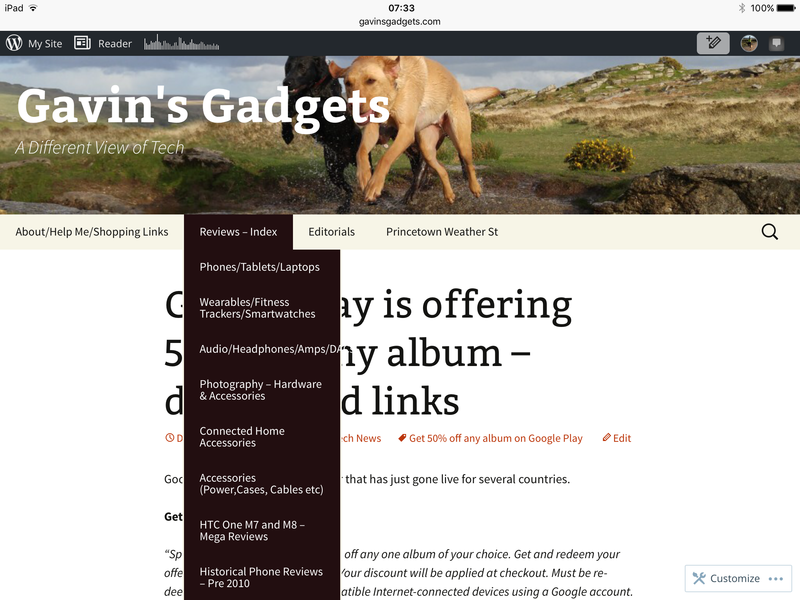 Now if you’re browsing on your PC, Mac, iPad or tablet you should see the above screen layout. Tapping on Menu, Reviews will open up the review menu structure. Now if you’re using a mobile device like an iPhone , the mobile version is as below. As you will see there are now 8 review sections. These have been updated to include all the latest published reviews. A new category has been started called “Photography”. In the Photography section will be reviews covering mobile photography accessories and or related camera attachments. There are several reviews in this section already. The Audio section covers Bluetooth headphones and systems, headphones of all types, amps, DACs and other cool audio gear. As there are over 30 plus reviews I have reorganised this page to make it easier to find exactly what you need. 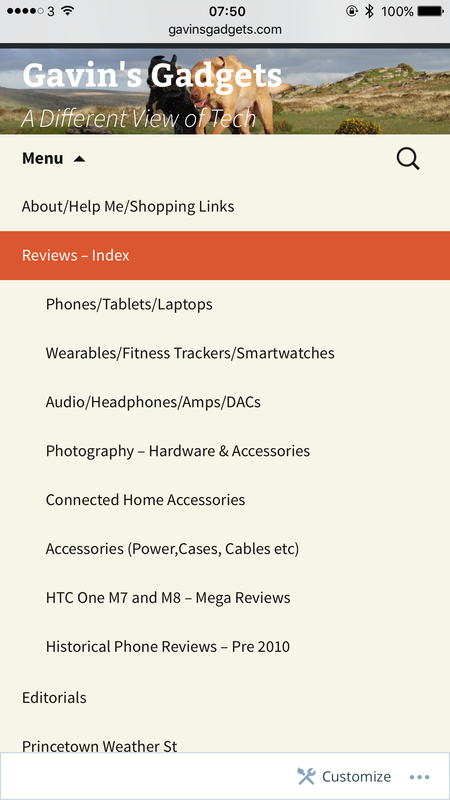 The Phones section covering mobile phone reviews across every operating systems , tablets, laptops and more now has over 80 reviews. Smart wearables section is expanding and again there are reviews across a number of different platforms. So far there are over 15 reviews. Internet of Things is an expanding review section too. The HTC One M7 and M8 section is a dedicated section which is for all the fans who keep reading this content. And if you fancy some nostalgic reviews from the post, take a look at the historical reviews. Some real gems in there. Going forward in 2016 there will be plenty more reviews too. Thank you all for visiting Gavin’s Gadgets. Welcome to the BlackBerry Priv, BlackBerry’s first android phone costing around £579 sim free when it becomes available to buy next month. This really looks like a gorgeous piece of hardware. Have a look at the hands on video and then leave a comments as to whether this is the ultimate android smartphone. – Security to Keep Private Matters Private – like all BlackBerry 10 devices, it is equipped with support for encryption, plus built-in anti-malware protection and back-up, wipe and restore. – Best-in-Class BlackBerry Keyboard – Type faster and more accurately on a touchscreen keyboard that learns how you write. With superior error correction, multi-language support, customised adaption, and flow, refuse to be bound by the mistakes and missteps that can hold you back. – Master Your Messages in the BlackBerry Hub – See more of what matters and experience inbox Zen with the BlackBerry Hub on a brilliant 5” HD display. Messages from across your multiple personal and professional roles, like BBM messages, texts, emails, and social media, all appear in one easy-to-manage view. – Battery that Powers Through a Full Day – You don’t work 9 to 5 – you’re the all-day, all-night type. With up to 25 hours of heavy use, the BlackBerry Leap will help you power through even your most demanding days. With an impressive 2800 mAh battery and the energy-saving optimisations in the BlackBerry 10 OS, BlackBerry Leap delivers battery life that will outlast even you. – More Ways To Access Apps – Discover and purchase great business and productivity apps through BlackBerry World and the latest Android apps and games through the Amazon Appstore. And access modern mobile web apps via the industry-leading BlackBerry Browser*. – The Power Of BlackBerry On Your Computer & Tablet – BlackBerry Blend seamlessly brings messaging and content on your BlackBerry to your PC and tablet to make you more productive instantly. Access your work and personal messages, notifications, documents, calendar, contacts and media in real time on whatever device you are on, powered by your BlackBerry. No saving to a cloud, no wires, no backing up. Just one question, why is printing documents, emails and photos not included with the operating system? This is a failure not just of this phone but others like the BlackBerry Passport. Below are all the reviews I have written covering the latest top 10 smartphones.